The American National Security Agency (NSA), and the British Government Communications Headquarters (GCHQ), similar clandestine intelligence agencies, stole SIM card encryption keys from a manufacturer, allowing the groups to decrypt global cellular communications data. The effort, according to The Intercept, took place in 2010, with the agencies breaking into a Dutch firm, Gemalto. The hack provides the government agencies the capability to monitor “a large portion of the world’s cellular communications,” according to the report. We are of course supposing that the government’s descriptions of its own capabilities are accurate. Update: Gemalto said it is investigating the issue and is not immediately able to confirm the report. You can find its full statement at the bottom of this post. The Intercept’s reporting is, once again, based on documents released by former NSA contractor Edward Snowden . The firestorm initially ignited by Snowden has dimmed in the past year, waning as the pace of revelations sourced from the information he released has slowed. The NSA and the GCHQ formed the Mobile Handset Exploitation Team (MHET), according to the report, which was built to do precisely what it’s name suggests. NSA Slide describing the keys that it compromised. Today’s revelations harken back to the earlier days of the Snowden saga, when the XKeyscore program was still a cause célèbre among the tech industry: The NSA and the GCHQ managed to infiltrate Gemalto by tracking the communications of its employees, using XKeyscore as their data collection tool of choice, according to The Intercept. So what was unveiled today is built on the tools that privacy advocates worried would be abused when they were first detailed. The use of presumably innocent peoples’ private communications data to lift the encryption keys of other individuals is precisely the sort of overreach that agencies operating in the dark are suspected of abusing. We have reached out to the NSA and GCHQ for comment but have not heard back. It is longstanding policy that we do not comment on intelligence matters. Furthermore, all of GCHQ’s work is carried out in accordance with a strict legal and policy framework, which ensures that our activities are authorised, necessary and proportionate, and that there is rigorous oversight, including from the Secretary of State, the Interception and Intelligence Services Commissioners and the Parliamentary Intelligence and Security Committee. All our operational processes rigorously support this position. In addition, the UK’s interception regime is entirely compatible with the European Convention on Human Rights. Steal millions of crypto keys and then complain publicly that encryption is a problem. The UK and US govs are shameless. Standing by itself, that the NSA would break into a private corporation to steal individual encryption key might seem shocking. However, recall that the NSA was more than content to tap the cables that linked private data centers of American technology companies located abroad. That particular program led to firms like Yahoo and Google greatly increasing their use of encryption in its various forms. Today the NSA and its British cohort have again been shown to have less than minor respect for private property, or privacy. Also, today’s release indicates that there might be more revelations of NSA activity coming. That fact is worth keeping in mind, as we are racing towards a showdown in Congress over renewing several parts of the Patriot Act — which provides key legal underpinning for parts of NSA surveillance — that are set to automatically sunset. So, there will soon be another national debate about surveillance and privacy. Stories such as today’s report concerning SIM cards, and the integrity of the encryption and data privacy of global citizens will certainly help set that discussion’s tone. 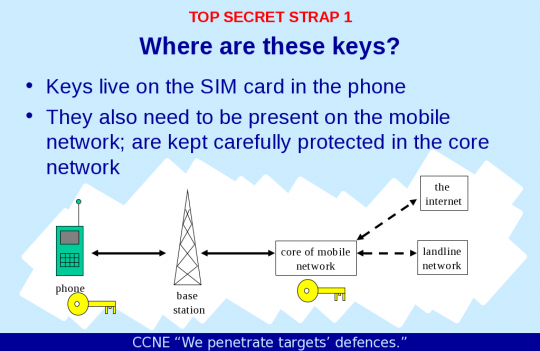 A publication reported yesterday that in 2010 and 2011, a joint unit composed of operatives from the British GCHQ (Government Communications Headquarters) and the American NSA (National Security Agency) hacked SIM card encryption keys engraved in Gemalto and possibly other SIM vendors’ cards. The publication indicates the target was not Gemalto per se – it was an attempt to try and cast the widest net possible to reach as many mobile phones as possible, with the aim to monitor mobile communications without mobile network operators and users consent. We cannot at this early stage verify the findings of the publication and had no prior knowledge that these agencies were conducting this operation.